How much H2O, CO2, and Methane are in the atmosphere? Here’s a nifty illustration. Time for those who are fearful of CO2 and methane to grow up. Another of those instances where you “feel” like a small amount of something surely has no consequence for the balance of things? No one wrote about feeling anything, troll. Keep your paws to yourself. Thanks Yonason That is a NIFTY explanation. Pity that David Attenborough hasn’t seen it before he has gone to a conference on Climate change where he is painting a picture of gloom and doom. In relation to the above post (thanks Kenneth) Glatzle (from Paraguay?) states animal growth over a number of years has increased by 100 million head. By comparison humans are increasing at 83 million/year! Next time don’t ignore the average life expectancy of livestock and humans. It also covers methane-eating bacteria; if it warms they’ll eat 5-30 times as much. It also tells you what the IPCC says about methane. Well, 3 years ago, anyway. Actually this paper is very much in line with what the “standard” GHG theory would lead one to expect. We can see this immediately if we compare the log of the “CO2 equivalent” with the log of CO2 as used in the various scenarios for the CMIP5 models. Of course, the idea of CO2 equivalent might be wrong – but it is a direct consequence of standard GHG theory. It seems to me that the methane alarmists simply don’t understand the theory that they claim to champion! Do I smell an “appeal to authority”? Why else establish that this guy should be viewed as a hard working scientist? Do I smell an “appeal to authority”? The introduction is designed to establish that Dr. Glatzle, as an agrobiologist, is knowledgeable and has an educational background in the subject matter (livestock). Don’t you find it strange that googling the name of this scientist only reveals climate skeptic websites talking about him? That alone should make you very skeptic about the validity of his research. No, we think the validity of one’s research rests on its stand-alone substance and merit. 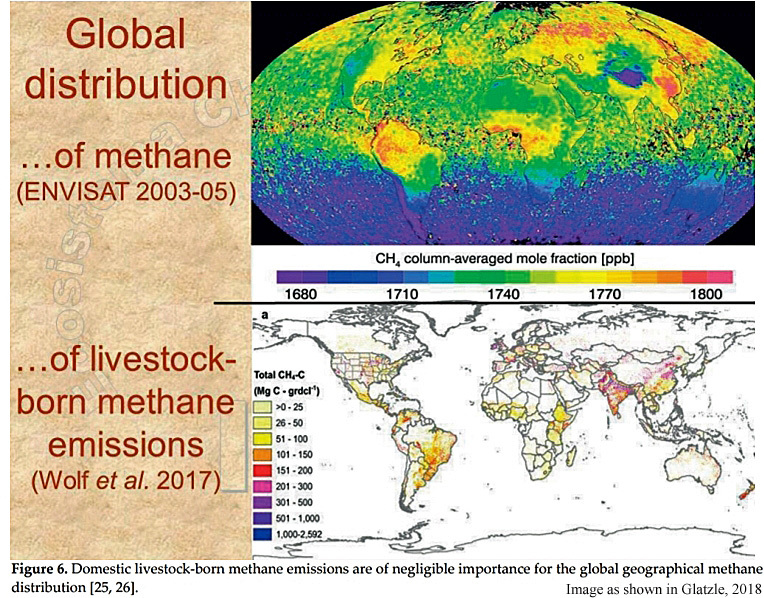 Do you have anything to add about the actual research itself (that shows methane is not a consequential factor in climate)? Or is going after the author the best “rebuttal” you can offer? I’ll assume so. The troll is back from troll-school. Aren’t we the fortunate ones! For every stupid idea, there are dozens of Leftists waiting in line to embrace it. Take Kalifornia for instance, which has a “solution” to the methane problem. And the stupider the idea, the longer the line. And yet, the damage has been done. There are those who will always embrace the original horror story.